Install outside C:\Program Files (x86)\ to avoid problems. Install SS2Tool to add widescreen/multi-monitor support and fix various compatibility and performance issues. All the digital distribution versions are pre-patched with NewDark. OS X and Linux versions use Wine. Essential patcher which integrates the NewDark patch and fixes various issues. Latest versions automatically disable the intro video for you (if you wish to re-enable it for whatever reason, add always_play_intro to the cam.cfg or cam_ext files). SS2Tool requires Vista or later due to included Rsync, however NewDark runs on 2000/XP or later. One can patch it on a Vista machine then transfer it to an older machine. Digital versions already include NewDark and compatibility fixes for modern systems however the tool is still necessary for proper mod support. Modding guide available on the PCGamingWiki blog. 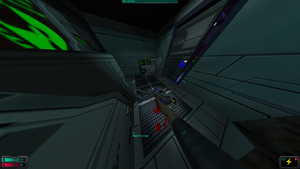 Alternate modding guide with updated links and mod info, from the System Shock 2 forums. Shock Community Patch - Fixes various bugs dealing with texture inconsistencies and general map issues. There's also a yet to be included prison event fix available here and a portrait fix here. Olfred's fixed objects - Fixes many small imperfections of SS2 objects: missing polys, z-fighting, incorrect texturing etc. SHTUP - Improves the texture quality of the level objects and scenery. Recommend using with earth dynamic/static newsky and Vurt's Water. Yet to be included military logos are also available as well as a fix for a (at the moment) broken texture, install the texture by placing it in SHTUP's \obj\txt16 folder. 400 - Improves the texture quality of the levels' terrain. Rebirth - Increases the poly count and textures of in game NPCs. Recommend using it with the High Res Protocol Droids and Eldron's Midwife as Nurse Bloome. Also checkout Cutscene 2 Rebirth, which was a project to update the in game cutscenes with the rebirth models. Unfortunaly only one Cutscene 2 Rebirth cutscene was ever made, but it's quality is excellent. Tacticool Weapon Replacements and RocketMan Alternative Weapons Pack - Improves the appearance of the in game weapons, both world models and in hand models. Tacticool focuses on standard and energy weapons while RocketMan focuses on heavy and exotic, however both packs include their own versions of the wrench; pick the version you like the most. Unfortunately neither of them include replacements for the EMP Rifle or Laser Rapier. You could use R&R&R's EMP Rifle to give the EMP Rifle a skin however. Recommend using with JMP Jack's Hires Weapons with player hands to give two handed weapons a proper second hand. Vurt's Organics / Goo - Improves the appearance of various organics in game. Recommend using in conjunction with Vurt's Flora Overhaul and Kaucukovnik's alternate wormpiles and wormbeakers. Note that SHTUP already includes biomatter, however Vurt's can be used as an alternative. Vaxquis Vintage Song Remake - Adds higher quality music to the game. DeepFriedBeer's Sound Upgrade and LarkSS' Small Sound Modification Pack - Improves the in game sound effects, particularly weapons. Note that the Small Sound Mod includes an elevator theme, which the original game lacked. If you do not like this, delete the elevator.wav file inside snd/amb. Quest Note Notifiers - Adds notification sounds for when a new quest is added or it's goal changes, similar to System Shock's successor BioShock. GamePig Unleashed - Restores some missing minigames. Repairman - Makes the repair skill actually useful. Alt weapon sounds - An alternative/expansion to DeepFriedBeer's Sound Upgrade that improves the weapons effects furthor (you can merge and overwrite DeepFriedBeer's original files if used as an expansion). Note that this mod contains a Duke Nukem voice clip for the weapon break sound, which can break immersion for some players. To fix this delete the file gunbrek1.wav (or if being used as an expansion simply don't copy). Vurt's Hi-Res Space Textures - SHTUP already includes a space texture, but this is a nice alternative. Necro Water - Alternative to Vurt's Water. Hi-Resolution Player Models - Rebirth includes player models, but here's nice alternatives. ImpyNickers RebirthSkins - Makes the Rebirth Hybrids look more vanilla (scary). Requires basic Rebirth to be loaded first. Modding the Wineskin version can be done by firstly installing the Windows version in a virtual machine, patching it and installing all desired modifications and then replacing the System Shock 2 installation within the Wineskin version with the custom version. If you are using the Steam version it may be necessary to deactivate Steam's "Keep up to date" function for this to work. cam_ext.cfg is the configuration file for the game once patched using SS2Tool. Native for digital versions; for retail versions install SS2Tool. Enable Windowed mode, then use desktop resolution in-game. Default framerate cap is 100 fps. See High frame rate. In addition to setting video options, editing cam_ext.cfg will allow you to set the interface/HUD scale and transparency. There are also custom crosshairs available (using them with a mod manager requires changing their extension from .ss2mod to .zip). For retail versions install SS2Tool. Change ;fov 90 to fov # (any number). Change framerate_cap 100.0 to the FPS cap you want. EAX (2) and A3D. For further info refer to this thread. Effects from both APIs are remapped to OpenAL in NewDark versions. Follow this guide for OpenAL Soft HRTF in NewDark. Multiplayer is officially unsupported in NewDark. Even so, a guide for use with NewDark is available here. Download and run the SS2Tool installer. At the Choose Components installation step, enable Safe Mode. Click Install and finish installing. Open cam_ext.cfg in Notepad or any other text editor. Uncomment the line ;d3d_disp_scaled_2d_overlay 64 by removing the semicolon. If this does not fix the issue, you may try scaling the UI to arbitrary resolutions by re-commenting out the above line (add back in the semicolon), uncommenting the line ;d3d_disp_scaled_2d_overlay 640 480 and adjusting the 640 and the 480 to your desired resolution. However, this may cause the ui to become blurry/pixelated, so try the initial fix first. 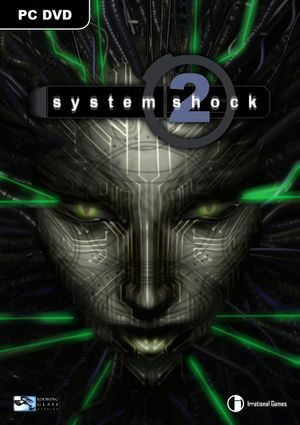 Find the System Shock 2.app and right-click on it. Click Show Contents and run Wineskin.app. In the Screen Options, you should see a checkbox that says Use Mac Driver instead of X11. Uncheck that box and that should fix the problem. If box is already unchecked then check it instead. This page was last edited on 1 April 2019, at 01:05.